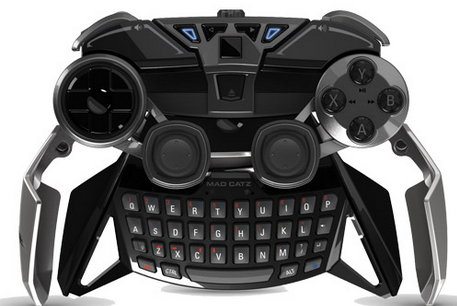 If your on the road all the time, but need some downtime to play your favorite game Mad Catz announced the L.Y.N.X. 9 Mobile Hybrid Controller, a radically different gamepad designed to offer uncompromised control and portability. This mobile controller is designed for the passionate gamer who typically plays across multiple devices. The L.Y.N.X. 9 features a design which allows it to fold into a compact footprint, fitting into a shirt pocket for travel without compromising on the classic console-style ergonomic feel gamers are accustomed to. The L.Y.N.X. 9 design uniquely enables the controller to be assembled in a variety of different configurations to fit the gamers’ chosen device. Consisting of three primary components (Left Wing, Right Wing and Controller ), the L.Y.N.X. 9 can break apart and attach to the included tablet stand, transforming a tablet of up to seven inches into a portable games console. Configure as a standard controller and enjoy living room gaming on a compatible set-top box or PC or attach the mobile clip and dock your smart phone for console quality gaming on the go. The L.Y.N.X. 9 is designed for precision performance, featuring hard-wearing metal and premium components, with action buttons rated to one million button presses. Anyone that owns this controller are encouraged to download the free L.Y.N.X. app to their Android smart device. Feel free to +1/Share if you enjoy! An IT guy trying to learn everything about technology and sharing it with you all. I'm a blogger and video blogger who highlights daily news in the tech industry, promoting tips and hacks for fellow techies. Check out my Youtube channel and subscribe to get the latest updates.